Thread by @HNIJohnMiller: "1) @ThomasWictor @drawandstrike @_VachelLindsay_ Did anyone hear that the US DoJ updated its election offenses guidelines in December 2017? 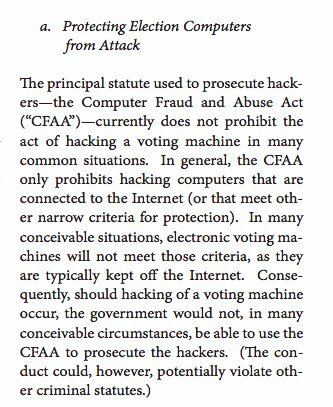 […]"
2) Most notably, this document is advocating for the FEDERAL prosecution of election crimes, as state courts often don't have the resources or motivation to handle voter fraud on the scale in which it is discovered. tend to be vulnerable to manipulation and intimidation." 5) "Detachment from local political forces and interests." 6) Nielson and the DHS was given control of the election integrity investigation in January after blue states proved reluctant to hand over their data, right in the middle of the Bannon dust-up. Which, as was insisted repeatedly, was a MASSIVE smokescreen. 8) "Despite substantial evidence of voter fraud, many states have refused to provide the Presidential Advisory Commission on Election Integrity with basic information relevant to its inquiry.. has asked the DHS to review its initial findings and determine next courses of action." 1) You're assuming Democrats act independently. This is incorrect. I understand why you might think this way, because that's how the GOP behaves, but there's a key difference between the GOP and the Dems. 2) The GOP has a large network of cooperating interest groups that all are moving in the same general direction in terms of candidates that GOP candidates have to interact with. 3) Effectively, this means that if Pelosi, Schumer, or a neoliberal equally high up gives the thumbs down, they turn off the campaign donation spigot for a Democrat overnight. 1) Trump can, but does not want, to declare a national emergency in order to build the wall. It is a very nice position to be in, really, knowing that he can get what he wants one way or the other. But he still wants it to go through congress. Why? 2) Because he wants a Republican congress and senate again after 2020. Right now, he's on track to win 2020. He's an incumbent in a good economy, and right now the markets both like a deadlocked government AND is now immune to the shocks that plagued the Obama shutdowns. 3) But he can't have another round of House and Senate elections like what we saw for 2018. We didn't bleed as much as we could have and even edged out a gain in the Senate, and Trump's name will be on the ballot, but the GOP isn't going to save itself, they're incapable of it. 1) Who’s on the attack? Its a question that’s asked thousands of times every day. Usually its asked as ‘who’s the aggro deck’, when people are playing competitive card games, which is where I learned the concept. 2) Essentially, in a one on one competition, there are two strategies. Offense, and defense. Nice and simple. The offense aggresively goes after their goals, the defense will prevent their opponents from achieving their goals until the defense can achieve its goals. 3) Whoever does best at their strategy, wins. So what happens when both competitors go into a match intending to be on the offense? What happens when both intend to be on the defense? Attorney General Jeff Sessions signed a memorandum yesterday providing direction to all civil litigating components and United States Attorneys’ Offices (USAOs) on the principles that should be followed when resolving a civil lawsuit against a state or local governmental entity. State and local governments have unique roles under the Constitution, and the Department is committed to ensuring that its practices in these cases are transparent, impartial, & consistent with fundamental constitutional principles, including democratic control & accountability.
! !NEW Q Drops!! 10/04/18 00:23 EST Q replies to Anon post re. @paulsperry_ tweet re Senate unanimously calling for DECLAS/release of 1000’s of 911dics related to SA! Q replies: Sponsor?
! !NEW Q!! 29:15 EST Q replies to Anon thanking him for the (you) by replying to his post & another Anon Meme #DoItQ Punisher Skull! Q says: UNITED WE STAND! ANONS are selfless, nameless, faceless, fameless, & FEARLESS! Q says to read this article carefully!! 1. Here is a point-by-point explanation of why Rudy Giuliani's contention that the Trump-Cohen tape is "exculpatory" is completely wrong. 2. Giuliani contends that the tape shows that Cohen and Trump discussed Trump making a $150,000 payment to cover the cost of the National Enquirer buying the rights to Karen McDougal's story. 3. Karen McDougal's story was that - shortly after Melania Trump gave birth to Baron (circa 2006 -07) - Ms. McDougal had a months-long affair with POTUS. 4. This story was threatening to break in October 2016 and negatively impact the Trump campaign right before the election.